Hockey is a pretty vicious sport, as just about any player can attest. But sometimes hockey gets a little rougher than it should, and we're not just talking about fights. Hockey injuries can be so bad that they make you feel sick to your stomach and completely forget it's all just a game. 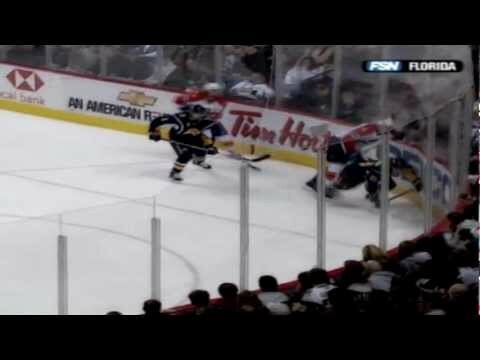 So, what are some of the worst hockey injuries ever? Is it a fractured skull? A slit throat? Luckily, for you morbid hockey fans out there, this is a collection a whole lot of them, and for some, there's even video to back it up. While there haven't been many hockey deaths in the NHL or international leagues, that doesn't stop many of these nasty injuries from being horribly gruesome. After all, skate blades, sticks, massive men skating at up to 30 mph... what could possibly go wrong? As a warning, hockey is generally not for the faint of heart and this is also not for the weak of stomach. There's blood, much of it happens live, and the carnage is discussed in detail. If you're not up for some high-impact gory stuff, this article might not be for you. Might we suggest golf? There are so many aspects of this video that are hard to watch. 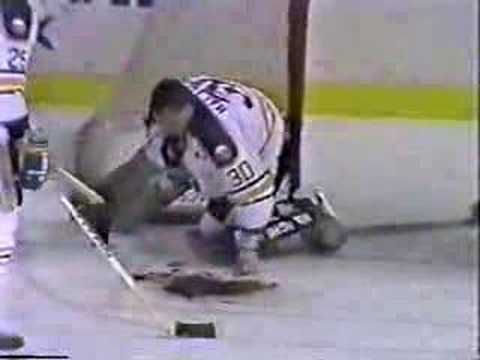 The initial collision with the goalie, Clint Malarchuk, doesn't seem that bad, then all of a sudden there's tons of blood spilling onto the ice. As the two players crash into the net, one of their skates comes up in a weird way and cuts open Malarchuk's carotid artery. As he was taken off the ice, 11 people in the stands fainted, two had heart attacks, and several of his own teammates vomited on the ice. Miraculously, Malarchuk survived the injury due to some very skilled surgeons and a fast-acting trainer who pinched Malarchuk's neck, cutting off the flow of blood until doctors arrived. It took over 300 sutures to close the wound and the vein. It's worth noting that all goalies now have to wear neck protection when they play. The video is now regarded as one of the worst sports injuries of all time. At 6'9", Zdeno Chara is a pretty big guy, the tallest ever in the NHL, so when he hits you, you feel it. In one of the more controversial items on this list, Max Pacioretty was on the receiving end of a hit by Chara in the wrong place at the wrong time in 2011. As the two went for the puck, Chara hit Pacioretty into the edge of the boards between the benches, effectively clotheslining him. 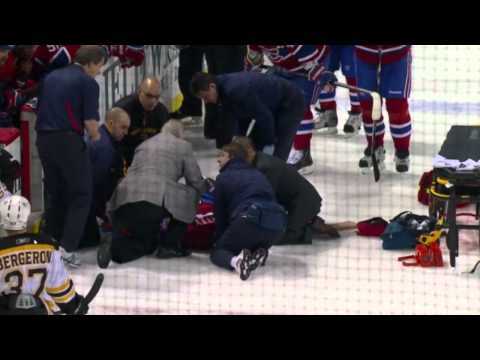 Pacioretty was unconscious before he hit the ice, and he didn't move even as emergency personnel came out to try to help. The expressions on the faces of the fans say it all. In the end, Pacioretty had a concussion and a neck fracture, but he did survive to play hockey again, and Chara was not suspended for what many believe was an intentionally dangerous hit. The boards were permanently changed to make sure the injury never happened again. During this seemingly routine play, Richard Zednik of the Florida Panthers goes into the boards, someone falls, and then he's suddenly racing for the bench bleeding profusely, so what happened? As one of his teammates fell, his skate blade came up and sliced Zednik's carotid artery. The blood spray was instantaneous, and it's a wonder he skated off under his own power, even though he collapsed the minute he was off the ice. Zednik recovered from the injury and was back playing hockey in mere weeks. 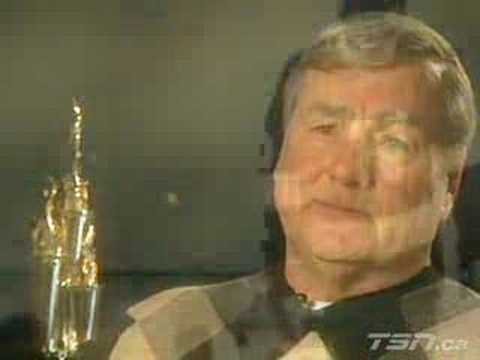 You may know the NHL has a Bill Masterton trophy, but you may wonder who the man behind the award is. Bill Masterton played as a Minnesota North Star in the 1960s and things were going okay until January 15, 1968, when he took a hit wrong and fell awkwardly. He hit the back of his head on the ice, because they did not play with helmets in those days, and lost consciousness instantly. Reports say that he regained consciousness again briefly, and simply said "never again" before slipping back out. Thirty hours after the initial hit, he died in the hospital from severe skull and brain injuries. He is the only confirmed NHL player, to this day, to have died from injuries sustained on-ice.